A crab that inhabits the glaciers of North Vast. Considered a delicacy of the North Sea, it is highly delicious, but its powerful strength, sturdy shell, and incredible ferociousness make catching it no easy feat. 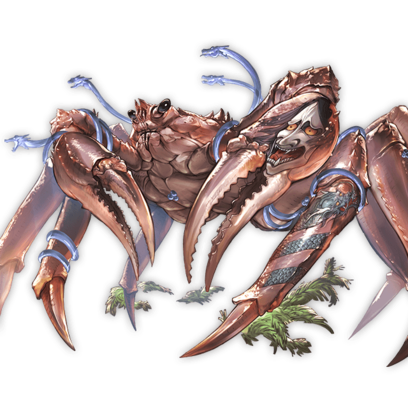 Its territorial nature means that when a particularly large specimen is born, it often clears lesser crabs from the area. 40% boost to dark Elemental attack. Lowers double attack rate. 40% boost to dark Elemental attack. 10% boost to defense. This page was last modified on 3 February 2019, at 20:06.